An aerial view of the University of Hawai’i at Manoa, Honolulu, and Diamond Head. On Friday, I finished my first of six weeks of lab work at the University of Hawai’i (UH) at Manoa’s Biogeochemical Stable Isotope Facility. My work here will contribute to one chapter of my PhD dissertation, and is supported by the Inter-university Training for Continental-scale Ecology program at the University of Utah and my SciFund supporters (thank you!). UH is the best place for me to complete this lab work because their facility is well equipped, and the lab personnel (especially my direct supervisor Dr. Brian Popp) have lots of experience using the analysis of compound-specific amino acids (I’ll explain in a bit…) research techniques to answer ecological questions that are similar to those of my study, and specifically for species that inhabit open ocean ecosystems (like sea turtles!). Over the next few weeks, I’ll be chronicling my research-in-residence experience. And after just one week, I can already report that Hawaii is not a bad place to work! The Big Picture: Previously, I collected epidermis (“skin”) samples from 350 individual olive ridley sea turtles from across an area of the eastern Pacific Ocean that spans the latitudes of Mexico and several countries in Central America, and extends offshore hundreds of miles — quite a large study region! These oceanic samples are rare due to the resource and logistical restraints of at-sea data collection, and therefore this is one of the first studies able to address large-scale marine turtle ecology and conservation questions in such breadth and depth. What I’m Doing: I am measuring the stable isotope values of my olive ridley skin samples in order to piece together a comprehensive snapshot of what individual turtles were eating during a certain time frame (in this case, a matter of weeks to months), and in which foodwebs. Here at UH, I am focusing on Nitrogen, and I’m trying to discern if olive ridleys have distinct foraging areas by latitude, or relative to distance-to-shore, or both. While at UH, I will be analyzing 24 samples for specific amino acids, which are the building blocks for proteins. (24 might not seem like a lot, but remember how hard it is to obtain these samples at-sea, and keep in mind that each sample costs about $225 to run!) 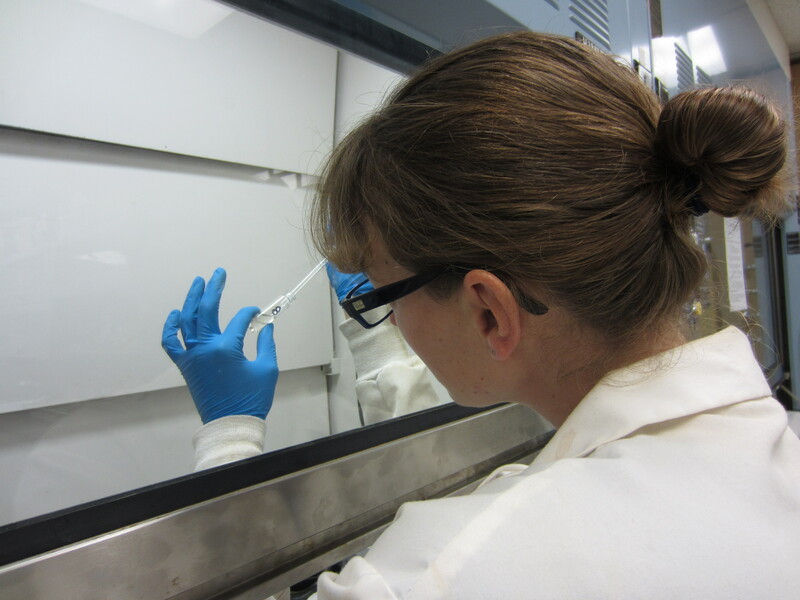 To do this, I first need to isolate the amino acids stored in each sea turtle skin sample –> chemistry! The very first steps of the process are freeze drying the skin sample and removing the lipids (resultant skin sample in top pane). Then, an appropriate amount (5-10mg) of sample must be ground with a mortar and pestle (lower left) and transferred to a glass vial (lower right), in which all the chemistry is performed. The 45-step sample preparation for my first batch of 9 turtle skin samples took about 4 days. 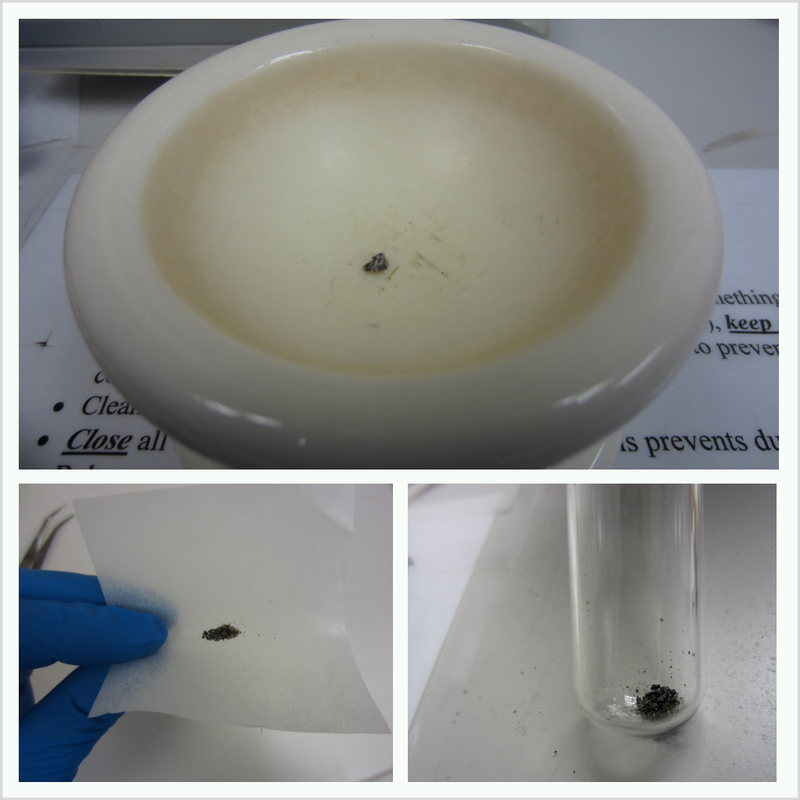 One down, at least two more batches to go! 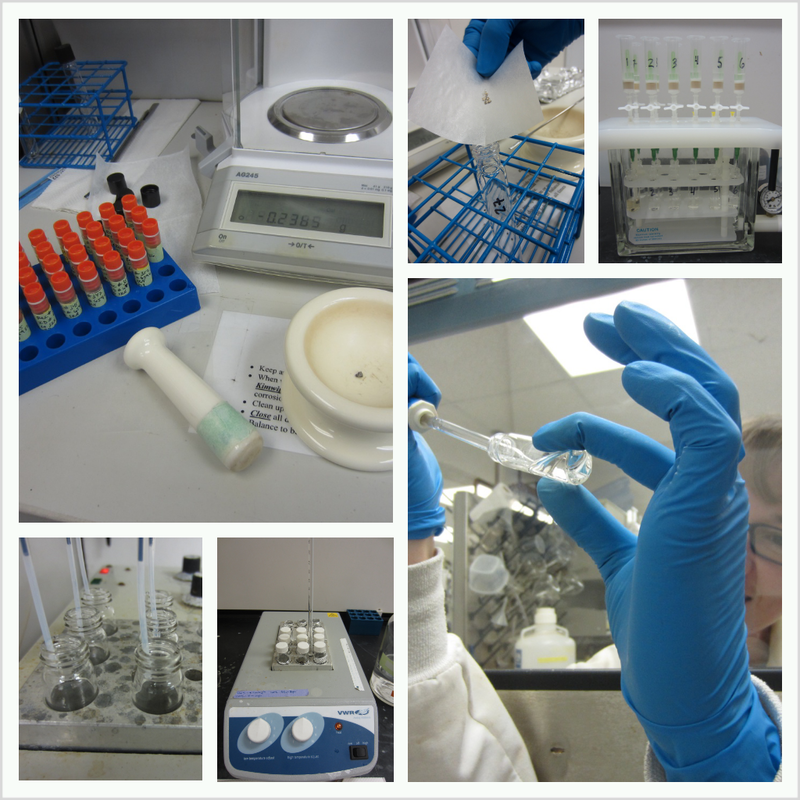 The third-to-last step in a 45-step sample prep process. 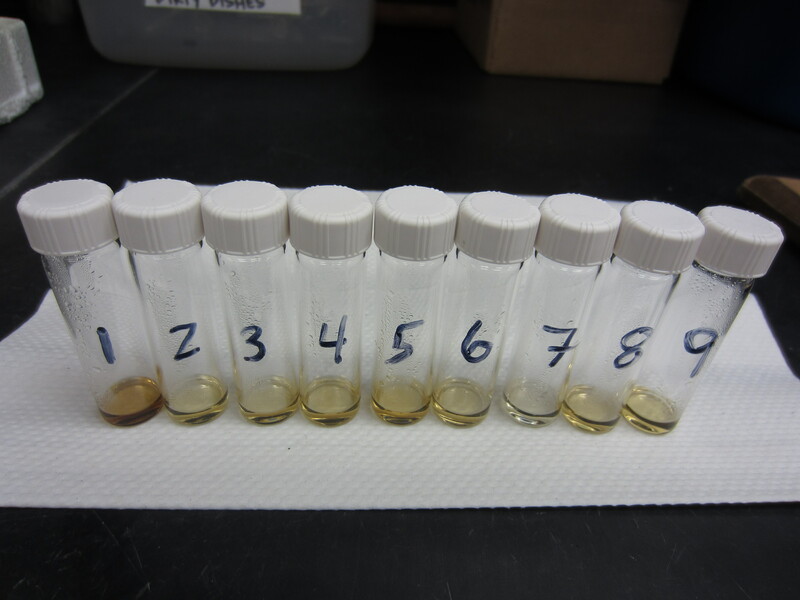 One of the last and most satisfying steps is collecting the distinct layer of chloroform-bound purified amino acids — the fruits of my labor! At the end of the week, I had nine of 24 samples prepped and ready for mass spectrometry… but we’ll save that chemistry lesson for another day! For each ‘Batch 1’ turtle skin sample, these are the isolated amino acids in chloroform, ready for analysis of stable nitrogen of individual amino acids!